عسکری, پوریا, خسروی, یلدا. (1395). ضرورت و بایسته‌های مطالعات صلح از دیدگاه حقوق بین‌الملل. پژوهش های روابط بین الملل, 6(22), 237-266. پوریا عسکری; یلدا خسروی. "ضرورت و بایسته‌های مطالعات صلح از دیدگاه حقوق بین‌الملل". پژوهش های روابط بین الملل, 6, 22, 1395, 237-266. عسکری, پوریا, خسروی, یلدا. (1395). 'ضرورت و بایسته‌های مطالعات صلح از دیدگاه حقوق بین‌الملل', پژوهش های روابط بین الملل, 6(22), pp. 237-266. عسکری, پوریا, خسروی, یلدا. ضرورت و بایسته‌های مطالعات صلح از دیدگاه حقوق بین‌الملل. پژوهش های روابط بین الملل, 1395; 6(22): 237-266. صلح در مفهوم کلاسیک خود، به «نبود جنگ» تعبیر شده که امروزه به آن «صلح منفی» گفته می­شود. منشور ملل متحد همین‌گونه از صلح را ارج نهاده و مهم‌ترین هدف سازمان را به صراحت در بند 1 ماده 1، حفظ صلح و امنیت بین­المللی قرار داده است و شورای امنیت نیز با اختیاراتی کم‌نظیر در جهت اعتلای این هدف مجهز شده است. از سوی دیگر، بند 3 ماده 2 منشور از کلیه اعضاء ملل متحد می­خواهد که اختلافات خود را با توسل به شیوه­های مسالمت­آمیزی حل و فصل کنند که صلح و امنیت بین­المللی و عدالت را به خطر نیفکنند. از سال 1945 و تأسیس سازمان ملل متحد به این طرف، آنچه به عنوان حقوق بین­الملل مدرن در دانشگاه­ها و از جمله در نظام آکادمیک ایران تدریس شده، تا حد زیادی از همین الگوی مصرّح در بند 3 ماده 2 منشور نشأت گرفته و آنچه از صلح مدنظر است، غالباً همان مفهوم منفی صلح است که در زمان تعارض، بر عدالت رجحان داده شده تا تهدیدات علیه امنیت بین­المللی خنثی شوند. این در حالی است که مفهوم صلح اعم است از «صلح منفی» و «صلح مثبت»؛ در چهارچوب «صلح مثبت» نه تنها عدالت در تعارض با صلح قرار نمی­گیرد، بلکه تحقق عدالت لازمه ایجاد صلح ساختاری است. این نگاه و قرائت جامع است که موضوع مطالعات صلح قرار گرفته و به زعم یوهان گلتونگ نروژی که وی را پدر مطالعات صلح در جهان نام نهاده­اند، از دهه 1950 به این سو، رفته‌رفته جای خود را در مباحث و محافل دانشگاهی باز کرده و امروزه به یکی از مهمترین گفتمان­ها در سطح آموزش عالی بدل شده است. در آموزش صلح، علاوه بر محتوا، چهارچوب و شکل آموزش نیز از اهمیت بسزایی برخوردار است. لذا برای انتقال مفاهیم فوق­الذکر نظام آموزشی نیز باید صلح­مدار و از خشونت ساختاری بری باشد. در نتیجه، شناسایی عوامل خشونت ساختاری در نظام آموزش عالی و برطرف‌نمودن آن باید توأم با اصلاح محتوا صورت پذیرد. ما در این مقاله ضمن تأکید بر اهمیت مطالعات صلح در جهت تقویت نظام آموزش عالی حقوق بین­الملل و حقوق بشر در ایران، با بررسی الگوهای موجود، به ارائه پیشنهادهایی در جهت ارتقاء سطح کیفی و اصلاح الگوهای آموزش صلح و مطالعات صلح در نظام دانشگاهی ایران خواهیم پرداخت. دپلانو، روزانا. (1395). شورای امنیت و بهره‌برداری استراتژیک از حقوق بین­الملل. ترجمه پوریا عسکری. تهران: انتشارات خرسندی. صادقی، دیدخت. (1392). «مسؤولیت بین­المللی حمایت و حاکمیت دولت­ها»، فصلنامه مطالعات روابط بین­الملل،6 (22). صص 156-133. عسکری، پوریا. (1392). «حقوق بشر و شرکت­های فراملی: پیمان جهانی» و چارچوب حمایت، احترام و جبران سازمان ملل متحد»، در جامعه بین­المللی و حقوق بین­الملل در قرن 21 (مجموعه مقالات اهدایی به دکتر محمدرضا ضیایی بیگدلی. تهران: انتشارات شهر دانش. A/CN.4/693. (2016). International Law Commission First report on jus cogens, by Dire Tladi, Special Rapporteur, Geneva. A/47/277. (1992). Report of the Secretary-General pursuant to the statement adopted by the Summit Metting of the Security Council [An Agenda for Peace]. January 21. A/55/305. (2000). Identical letters dated 21 August 2000 from the Secretary-General to the President of the General Assembly and the President of the Security Council: report of the Panel on United Nations Peace Operations. UN General Assembly. August 21. A/70/674. (2015). Plan of Action to Prevent Violent Extermism. General Assembly of United Nations. December 24. A/RES/53/25. (1998). International decade for a Culture of Peace and Non-Violence for the Children of the World 2001-2010. UN General Assembly. November 10. A/RES/49/184. (1994). United Nations Decade for Human Rights Education. UN General Assembly. December 22. Anasarias, E and P. Berliner. (2009). Human Rights and Peacebuilding, in Handbook on Building Cultures of Peace. Rivera, J. D. New York: Springer. Anderson, R. (2004). A Definition of Peace. Peace and Conflict: Journal of Peace and Psychology, 10 (2), pp.101-116. Bajaj, M. (2008). Critical Peace Education Available at: https://www.tc.columbia.edu/centers/epe/PDF%20articles/Bajaj_ch16_22feb08.pdf (accessed on 2016, Oct 2). Berghof Foundation. (2012). Berghof Glossary on Conflict Transformation. Berlin: Berghof Foundation Operations GmbH. Brock-Utne, B. (1998). Peace Education in an Era of Globalization. Lecture given at University Internacional de Menorca. Available at: www.africavenir.org/fileadmin/_migrated/.../BrockUtnePeaceEduGlobalisation.pdf, (accessed on 2016, Nov. 2). Danesh, H. B. (2008). The Education for Peace integrative curriculum: concepts, contents and efficacy. Journal of Peace Education, 5 (2), pp. 157-173. Dilts, A. (2012). Revisiting Johan Galtung’s Concept of Structural Violence. New Political Sience, 34 (2), pp. 191-194. Fisch, J. (2012). Peoples and Nations, in Oxford handbook of the history of international law. Fassbender, B and A. Peters. United Kingdom: Oxford University Press. Galtung, J. (1969). Violence, Peace and Peace Research. Journal of Peace Researc,6 (3), pp. 167-191. …………… .(1983). Peace Education: Learning to Hate War, Love Peace, and to Do Something About It, in International Review of Education, Special Issue: The Debate on Education for Peace. Hamburg: UNESCO Institute for Education. ………….. . (1990). Cultural Violence. Journal of Peace Researc, 27 (3), pp. 291-305. Gaurier, D. (2012). Cosmopolis and Utopia, in Oxford handbook of the history of international law. Fassbender. B and A. Peters. United Kingdom Oxford: University Press. HR/PUB/12/3. (2012). World Programme for Human Rights Education. Geneva: United Nations. ICJ. (1970). Barcelona Traction, Light and Power Company, Limited (Belgium v. Spain). Second Phase. International Court of Justice. Available at: http://www.refworld.org/docid/4040aec74.html, (accessed 2016, Dec 16). ICJ. (2003). Case Concerning Oil Platforms (Islamic Republic of Iran v. United States of America). International Court of Justice. Available at: http://www.refworld.org/docid/414b00604.html, (accessed 2016, Dec. 15). Page, J. S. (2008). The United Nations and Peace Education. 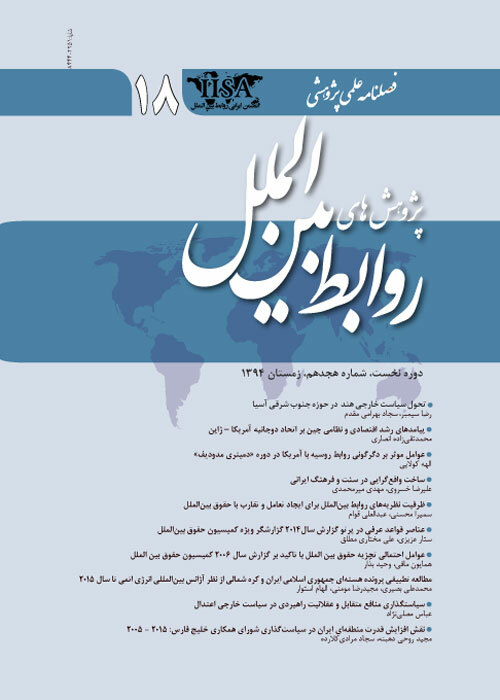 Ensyclopedia of peace education, Available at: https://www.tc.columbia.edu/centers/epe/PDF%20articles/Page_ch9_22feb08.pdf,(accessed on 2015, Oct 12). Quirico, O and J. Brohmer and M. Szabo. (2016). States, Climate Change and Tripartite human rights: the missing link, in Climate change and human rights. Quirico, O and M. Boumghar. United Kingdom: Routledge. Reardon, B. A. (1997). Human Rights as Education for Peace, in Human Rights Education for the Twenty-first Century. Andrepoulos, G. J and R. P Claude. Philadelphia: University of Pennsylvania Press. S/RES/1973. (2011). Security Council resolution 1973 [on the situation in the Libyan Arab Jamahiriya]. UN Security Council. March 17. Torney-Purta, J. V. (1984). Human rights, in Teaching for International understanding, peace and human rights. Graves, N. J, O. J. Dunlop and J. V. Torney-Purta. France: Unesco Publications. UNESCO Medium Term Plan. (1977). Medium-term plan (1977-1982). Available at: http://unesdoc.unesco.org/Ulis/cgi-bin/ulis.pl?catno=33260&set=4ACFEA94_1_45&gp=0&lin=1&ll=s,(accessed on 2016, Dec 5). UNESCO Constitution. (1945). Constitution of the United Nations Educational, Scientific and Cultural Organisation. UN Educational, Scientific and Cultural Organisation (UNESCO). November 16. UNESCO. (2016). Global Education Monitoring Report, Second edition. France: UNESCO Publications. Vienna declaration. (1993). Vienna Declaration and Programme of Action. UN General Assembly. July 12.